One of the biggest stumbling blocks in realizing the potential of biocomposites is the ability to find an application in which its use makes sense and it can be speedily transformed into a commercial product. Through ideas generated by some of our employees, a concept for a permanent roof structure that could be used for shelters including gazebos and kiosks was formulated. This concept soon grew into a reality when Eastside Industrial Coatings and Composites, a local composite fabricator, became very interested in its market potential. Through collaborations established between the Composites Innovation Centre (CIC) and Eastside, a 10 ft. by 10 ft roof structure was designed incorporating a natural fibre hemp nonwoven mat combined with additional fiberglass reinforcements, a vinyl ester resin and a protective gel coat. This style of roof not only utilizes rapidly renewable agricultural fibres but they are maintenance free and more cost effective than the all-timber alternatives. “We were looking for new product lines for our composite manufacturing operation” explained Chad Brick, President of Eastside,”and, from an initial review of the market, a real consumer need was identified. Combining conventional materials with natural fibres made for an environmentally friendly product that has very good market potential”. Tooling was produced and prototype roof panels fabricated. This first unit was assembled by a local contractor and commercialization partner, Gord Taylor of GT Shelters, and recently displayed at a local cottage exhibition. 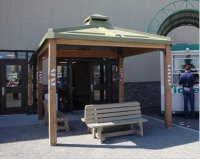 Additional roof installations are planned including a larger version for kiosk applications and, with high initial consumer interest, commercial sales are expected to commence shortly. The CIC embarked on a series of composite recycling projects that commenced in August 2008 at the request of the composites industry in both Manitoba and Southern Interior BC, with support from the National Research Council Canada’s Industrial Research Assistance Program (NRC-IRAP), and with the main aim to reduce landfilling of production waste and cost reduction. Little did the CIC know then that Neil Rempel from Fibre Recovery Products, Winnipeg was also working on composite recycling through the development of dedicated composite recycling equipment. Over the course of several months a highly successful relationship between the CIC and Fibre Recovery Products was developed that encompassed end market research, testing, recycled composite optimization and equipment development. “The CIC helped me to identify a wider range of market opportunities in which recycled fibres could be used,” said Neil Rempel, Fibre Recovery Products. “Their support in providing contacts and testing assistance was really supplemental to my development of a recycling processing capability and end products containing recyclates”. “Initial results have been very positive,” commented Will Darracott, Project Lead for recycling at the CIC. “Recycled fibres in concrete, for example, can be used for shrinkage crack reduction. Preliminary results indicate a 98% reduction in crack area when using recycled fibres compared to plain concrete. The recycled fibres also outperformed 3 out of 4 industry standard fibres tested for comparison, which was great news, considering the recycled composite fibres have not been optimized yet”. These results, in parallel with business feasibility studies, provide high hopes for the future of composite recycling, so much so that a recycling centre is being set up in Winnipeg by Equinox Industries, with support from Fibre Recovery Products and the CIC. Over the next year, further testing will be conducted by the CIC together with support for the implementation of recycled composite waste in several applications.